With the 2018 AFL Draft kicking off on Thursday and continuing on Friday, there are plenty of local stars to keep an eye on, with the Dandenong Stingrays boasting an array of potential draftees. The Rays took home the 2018 TAC Cup Premiership – the first in their history – and it was their depth of talent that won them the flag. Because of this, expect plenty of Stingrays’ names to be called over the two-day draft. Sam Sturt and Bailey Williams are Dandenong’s top prospects. Sturt’s meteoric rise into a potential top-20 draft pick is incredible. A prodigious cricket talent, Sturt only broke into the Stingrays side late in the season, but his athleticism and brilliance around goal immediately stood out. Williams has long been seen as a potential first round selection and although he has drifted throughout the year, he will most likely be taken around the pick 30 mark. The club that drafts him will be getting a versatile player, one that can play forward or ruck, and despite his size can compete with the best of them on the ground. Will Hamill and Toby Bedford may be the next Rays selected. Bedford, who is a Melbourne Next Generation Academy player, will find his way to Melbourne as they can match any bid for him. The Demons currently hold picks 29, 32, 38 and 54; 38 or 54 will most likely be used on Bedford. Hamill is an exciting prospect with speed and smarts, he will offer his new club run and carry and will most likely be selected somewhere in the range of 35 to 55. Riley Bowman and Zac Foot offer plenty of value as late picks and should end up finding an AFL home. Bowman is one of the best ruck prospects in the draft and a team looking to develop a young ruck won’t go wrong by selecting Bowman. 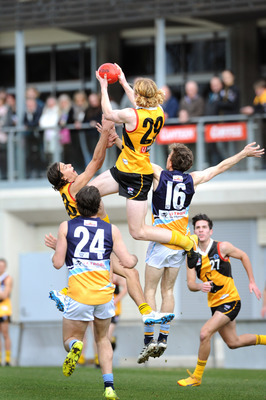 Foot can play all over the ground and whether he goes forward or has a run in the midfield, has proven himself as a bonafide AFL draft prospect. The likes of Sam Fletcher and Mitch Riordan are a chance to find AFL homes and if they aren’t selected in the national draft, are tantalising rookie draft prospects. Captain Campbell Hustwaite, who came equal-third in the TAC Cup best and fairest, also wouldn’t disappoint as a rookie selection.